You know Ashworth! This is the stylish apparel with that cool golf stick figure drawing. I've been wearing Ashworth shirts for probably twenty years. I can't lie -- it's all because of Fred Couples. The first time I ever went to a PGA tour event, my golf nerd friend raced me over to watch Freddie. This guy has always been a fan favorite because of his long looping fluid swing and his laid back "just another walk in the park" attitude. Fred is still going strong. This is his first year on the Champions tour (and he's still one of the longest hitters on the PGA Tour). And Ashworth is still just as popular, now sponsoring Stuart Appleby, Chris DiMarco, Rich Beem, Jim Nantz, Rick Smith, Nick Watney, and Steve Flesch. 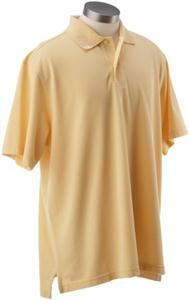 These solid polos are made with Ashworth's EZ-Tech finish. I love these because they are very breathable, and the material wicks away sweat as I grind through my round. Other cool features are the open sleeve and the vents in the neckline. And of course, the best part of wearing Ashworth is the trendy Golfman Logo that looks like a pencil doodle drawing. You can't go wrong with Ashworth, but for those real athletic types who are looking for the best in lightweight, breathable golf wear, I would recommend Nike's Dry Fit line. This is by far the best shirt for providing a shirt that breathes and moves with you when you swing the golf club. However, you won't look as good as Fred Couples.